By next week, sixteen states and the District of Columbia will have submitted plans to the U.S. Department of Education to meet their obligations under the Every Student Succeeds Act. These publicly available documents describe how states will satisfy a number of ESSA’s requirements, including those concerning testing, school improvement, and accountability. Unfortunately, just as states mostly squandered ESSA's school improvement flexibility, most of these first seventeen plans don’t do enough to hold schools accountable for meeting the educational needs of high achievers—especially those growing up in poverty. ESSA affords states a critical opportunity to right many wrongs of No Child Left Behind. A strong accountability system signals to schools that the progress of all students is important, but NCLB failed at this by creating incentives for schools to focus their energy almost exclusively on helping low-performing students get over a modest proficiency bar, while neglecting those who were likely to pass state reading and math tests regardless of what happens in the classroom. This may be why the United States has seen significant achievement growth and improved graduation rates for its lowest performers over the last twenty years but lesser gains for its top students. The Every Student Succeeds Act remedies this by permitting states to more accurately determine school quality than was possible under NCLB, by using growth measures and performance indexes in place of proficiency rates. “Percent proficient” is a poor measure of school quality, as it is, among other things, strongly correlated with demographics, family circumstance, and prior achievement. A performance index or average scale scores: Achievement is measured in a way that goes beyond simple proficiency, by using a performance index (which is expressly permitted under ESSA) or average scale scores. For example, a state might create an achievement index that gives schools partial credit for getting students to a basic level of achievement, full credit for proficient, and additional credit for getting students to an advanced level. 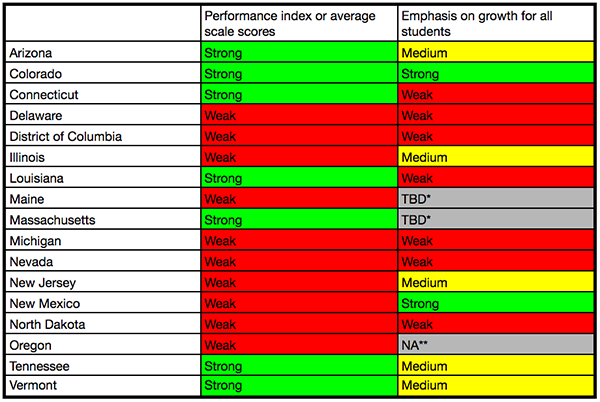 An emphasis on growth for all students: When calculating summative school grades, growth of all students (as opposed to more myopic, exclusionary measures such as growth to proficiency or growth for low performers) from one year to the next counts for at least 50 percent in elementary and middle schools, and for at least as much as achievement in high schools. Measures of growth for all students do a far better job of capturing schools’ effects on children’s educational attainment and are thus much fairer to schools. Moreover, in broadening schools focus beyond those near proficient, it helps high achievers—especially those from disadvantaged backgrounds. Alas, as Table 1 demonstrates, only one state’s plan in the first bunch of seventeen meets both of these criteria—Colorado, which my colleague David Griffith has already praised—though Arizona, Tennessee, and Vermont come close. Six plans do virtually nothing to signal that all students, including high-achievers, are important: Delaware, the District of Columbia, Maine, Michigan, Nevada, and North Dakota. *State plans to use annual summative grades but hasn’t yet determined the weight for each indicator. **State will not use annual summative grades. Only seven of the first seventeen states to submit ESSA plans will measure achievement with performance indexes or average scale scores. Put another way, close to two-thirds will repeat No Child Left Behind’s mistaken focus on proficiency rates alone—measures that, as Morgan Polikoff observes, incentivize states to lower their standards, encourage schools and teachers to ignore low- and high-achievers, throw away vast quantities of useful information, and misrepresent achievement gaps and school effectiveness. The news is a little better for growth. Two states, Colorado and New Mexico, deserve gold stars, as growth will count for at least 50 percent of summative grades in elementary and middle schools, and for at least as much as achievement in high schools. Another five come close. In Illinois and New Jersey, for example, growth constitutes 50 percent of summative ratings for elementary and middle schools, but 0 percent for high schools. And Arizona, Tennessee, and Vermont measure growth for all schools, including counting growth for more than 40 percent for grades K–8, but each misses the 50 percent mark. Meanwhile, one state, Oregon, has decided not to issue summative school grades; and two states, Maine and Massachusetts, have not yet determined the weight of their growth measures. Still, that leaves seven states that have missed this opportunity to make growth for all students a major factor in their ESSA accountability systems. These various shortcomings signal to schools that high achievers—including those from disadvantaged backgrounds—don’t deserve to have their education maximized. Policymakers across the country seem to be acting on the oft-said but always-misguided view that higher-achieving students require less attention because they’ll be fine no matter what. Such neglect is inequitable. The students most harmed are disadvantaged high achievers—boys and girls who face such challenges as disability or poverty, or who comes from homes in tough neighborhoods, with ill-educated parents who don’t speak English. They depend far more than upper-middle-class students on the public education system to do right by them. So if they don’t receive the attention that they—like all children—deserve, many will fall by the wayside, destined by circumstances beyond their control never to realize their full potential. The country also needs these children to be highly educated in order to ensure its long-term competitiveness, security, and innovation. Our highest achievers are young people who hold perhaps the greatest promise for making major advances in science, technology, medicine, the humanities, and much more. Our nation’s economic vitality and growth depend heavily on the quality and productivity of our human capital and its capacity for innovation. In sum, sixteen of the first seventeen state ESSA plans fail to include accountability indicators that fully signal a commitment to providing all students with the education they deserve. And six of the sixteen do virtually nothing on this score. If we see a similar pattern with the states that submit plans in September, many of America's high achievers—especially those from disadvantaged backgrounds—will continue to be an afterthought, a fate no child should suffer. Brandon L. Wright is the editorial director of the Thomas B. Fordham Institute. The views expressed in The High Flyer are not necessarily those of NAGC.